The Chinese New Year is the biggest travel time within China. It is the equivalent of the Western Christmas/New Year celebrations or Thanksgiving. Many people travel back to their home towns and cities for extended celebrations with their families. Most Ex-pats leave the Country! (Shops are closed, drivers are with families, Ayi’s are with families, so it is difficult to stay). We had decided to book a trip to anywhere that we could get flights to. All our Emerald friends had told us that getting out of China would be difficult at this time of year, and they were right. Owen and John (friends who we would be travelling with), spent almost a day with a travel agent working out an itinerary that would work for us all. It is 3 weeks to go before we depart and it looks like I will not be able to get a Visa. I research a fast passport renewal process when you are out of the UK and am told that I can do an expedited service (2 weeks) through Hong Kong (mainland China no longer allows UK passport services). However, my Residence Permit is in my “old” (current) passport and I will need that to get back into China. The Chinese Government also require you to carry your passport at all times, so the renewal process is unique in that you do not send your old passport in with the application. I took a colour photocopy of my passport, complete the application form, take copies of our travel itinerary, rush to get photo’s done and DHL the packet to Hong Kong on January 25th – exactly 2 weeks and 1 day before travel day. I check my UK bank account and see that the expedite passport service fee has been deducted from my account on January 31st, which means that the UK has received the application and is processing it. Yippee, I think! Then I wait and wait. Wednesday February 6th and now I getting nervous as I still have no passport. I have processed Vietnam Visa-on-Arrival paperwork for the rest of the family so they are good to go. Owen is in the UK and says that he can collect my passport from the UK office if it is there. I phone the helpline to see if this can be done and am told that there is no way I will be getting my passport before Saturday February 9th and there is no way that Owen can collect it. HELP – what is a girl to do? The helpline is actually helpful and I am told that if I visit the British Consulate in Shanghai they may be able to issue me an Emergency Passport. Now, the new research starts…… will Hong Kong and Vietnam allow entry with an Emergency passport? Can I get a Visa in time? Will I be allowed back into China on a cancelled passport with a valid residents permit AND an emergency passport? Will the Consulate even process an Emergency Passport for these reasons? Thursday morning dawns and I am waiting for the Consulate to open to get answers to all these questions! Eventually, they phone me back at noon to let me know the answer to all the questions is YES, YES, MAYBE, YES and YES! Again, YIPPEE, I think! The only problem may be in getting a Vietnam visa as it is Lunar New Year celebrations across Asia and many Government agencies are already closed. I rush down to the Consulate with photos and paperwork and they tell me to come back first thing in the morning to collect my Emergency Passport. I am waiting outside the Consulate doors on Friday morning for opening time! 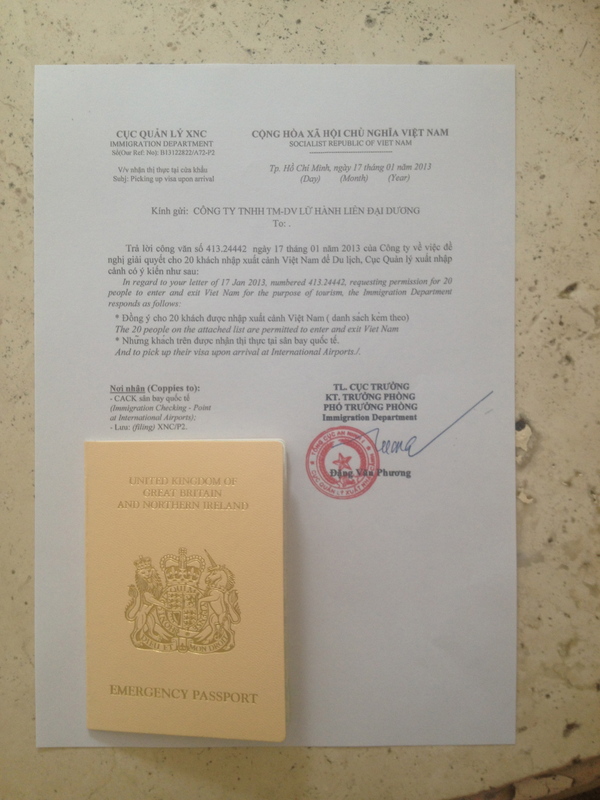 2 minutes later and I have a passport in hand – valid for 7 months for 1 trip only – to Vietnam via Hong Kong!! Now, to get the Visa. I find a company online that will process it for me – for an astronomical fee, of course! Friday afternoon and I have the emergency passport and Vietnam Visa-on-Arrival approval! Less than 24 hours before travel time! I am so glad that I phoned the UK passport helpline – they immediately had visibility into my application process and could give me the information that enabled me to work on a Plan B. I have Marie, Lin and Emma to thank for that advice! It was becoming the morning bus stop conversation – the ongoing saga of Sara’s passport!! Everyone was nervous for me. I had offers to spend Chinese New Year with the only set of friends staying in Shanghai! I was so nervous travelling on this document, but I had no problems with any immigration. Just a few funny looks and intelligent comments like: “this is an emergency passport” and, “did you know that this is an emergency travel document”. February 20th – I still do not have my full passport back from the UK. So much for an expedited process! This entry was posted in Uncategorized and tagged "This is China", Chinese New Year, Paperwork, Passport, travel, Vietnam, Visa. Bookmark the permalink.